Get in line, boys and girls! It’s popsicle time! When our son had the good sense to leave home after college, popsicles became obsolete in our kid-free zone. Silly me. It’s time for a comeback. Those cooling, refreshing treats are going to be in my freezer all summer! Of course, you could buy popsicles, but why? Why would you do that, when you can have a freezer full of all-natural, healthy, low-sugar treats on hand for when the temperature makes you want to lie down and take a long nap? It makes so much more sense to capture all the fresh fruit of summer in frozen blocks of deliciousness yourself. It actually takes less time to make a batch of pops than it does to go to the store and buy them. Admittedly, there is a waiting period while they freeze, but that’s why you should always keep one batch ready to eat while you get the next batch going! This recipe is a blueprint: Puree beautiful ripe fruit (in this case strawberries) with simple syrup (or not) and some lemon juice. Pour into molds, swirl in a little yogurt, and voila! Once frozen, remove the pops from their molds and place them in plastic bags for longer storage. This also frees up the mold for MORE POPSICLES! You can also leave out the sweeteners and go sugar-free, which makes for a handy snack when you are counting calories. Regular yogurt works best if you are looking for a swirled effect with your finished frozen popsicles, but Greek yogurt is fine to use, too. Greek yogurt needs to be thinned with a little milk if you want to achieve the swirl, but you can also just stir it into the fruit and fill the molds. Lemon or vanilla yogurt would also pair nicely with summer fruits. So many choices! Once you’ve made this strawberry version, you can try others. Peaches, melons, blueberries, raspberries and blackberries (strain the seeds) are just a few fruits to experiment with. You can also use either lemon or lime juice to bring out the fruits best flavor, or infuse the syrup with herbs by immersing them in the sugar syrup and then straining it. This year I decided to buy some bona fide popsicle molds, and I am loving these Norpro Frozen Ice Pop molds from Amazon, which make ten 3-ounce popsicles. Just be sure to buy lots of extra sticks. You’re going to need them. 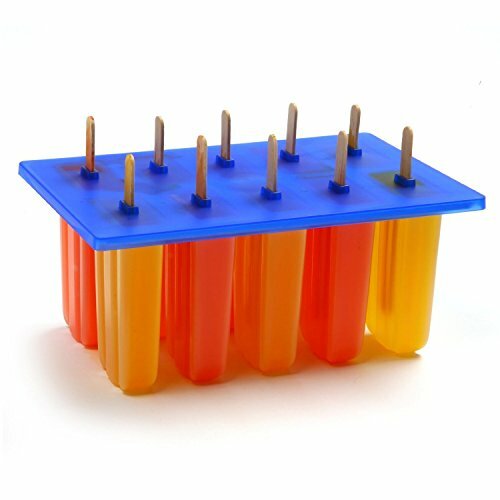 If you haven’t quite gotten around to buying popsicle molds yet, you can pour the puree into Dixie cups. Freeze them for at least an hour on a flat tray, and then insert popsicle sticks before freezing them all the way. These popsicles have more strawberry than yogurt. If you'd like closer to equal parts strawberry and yogurt, increase the amount of yogurt to 1 1/2 cups. 1 Make the simple syrup: In a small saucepan over medium heat, stir the sugar and water together. Bring to a boil and stir until sugar is dissolved. Chill until cold, or set the pot in a bowl of ice to cool. This will make about 3/4 cup syrup; you will not use it all for this recipe. The leftover syrup can be stored in the fridge for several weeks. 2 Puree the strawberries: In a blender or food processor, puree the strawberries, lemon juice, and 3 tablespoons of the simple syrup until smooth. Taste and add more simple syrup if you like. Transfer to a measuring cup or bowl. 4 Fill the popsicle molds: Fill the molds by alternating about 1 tablespoon of fruit puree and 1 tablespoon of yogurt. Continue alternating yogurt and berries until the molds are filled to 1/4-inch from the top (this allows for expansion when freezing). With a skewer or chopstick, poke deep into the popsicle molds and swirl the yogurt and fruit together. Note: Exact proportions will depend on the size of your popsicle molds. You may end up with leftover strawberry puree, which can be refrigerated for up to 5 days or frozen for up to 3 months for future popsicles or stirred into plain yogurt for breakfast. 5 Freeze the popsicles: Freeze for 1 hour. Remove the mold from the freezer and insert the popsicle sticks, leaving about 2 inches of each stick above the mold. Return to the freezer for another 3 to 4 hours, or until frozen. 5 Serve or store: Dip the bottom and sides of the mold in a container of hot water (do not submerge all the way), and hold just long enough to slightly thaw the popsicles so they release from the mold. Serve at once, or transfer them to freezer bags and store in the freezer. Three popsicles will fit snugly in a quart-sized freezer bags. Leave them out to soften for a few minutes before diving in, if you can wait that long. Hello! All photos and content are copyright protected. Please do not use our photos without prior written permission. If you wish to republish this recipe, please rewrite the recipe in your own unique words and link back to Strawberry Yogurt Popsicles on Simply Recipes. Thank you! These were not only great for snacks, but for dessert as well. I loved the balance between the sweet berries and the tart greek yogurt! Great recipe! I followed the recipe as stated and added a little Strawberry syrup in too. Definitely planning on making some sort of yogurt popsicles for my kiddos in the future! I love all things food! Thanks for sharing your recipe! Love that these are so flexible for options — and that mold that stands up looks perfect!